Iran is one of the most incorrectly perceived countries of the world. Mass media is busy picturing them as extremists with nuclear missiles while reality couldn't be farther from the truth. We found the most welcoming people we've ever met, suffering for the reputation of their country and, many of them, with very little interest in Quran. The trip started from Tehran. Getting a visa for Iran was not easy as I was supposed to apply for it abroad but there was also a Visa on Arrival. The information you find regarding it on Internet is vague and sometimes contradictory but I took my chances and easily obtained one in the airport. 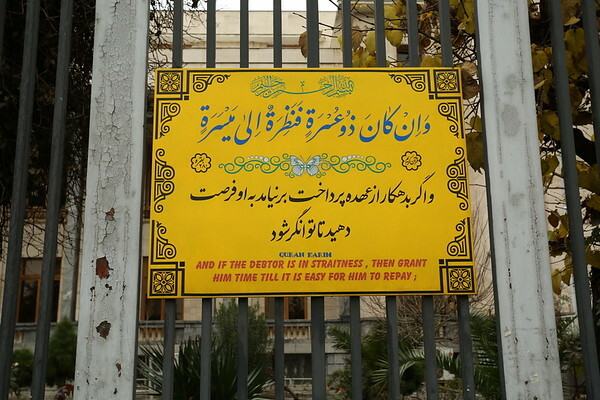 I don't know what the building is but there were lots of quotes from Quran on the fence.